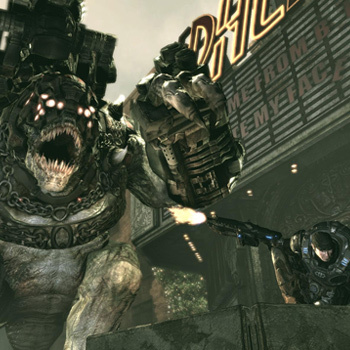 Gears of War blends tactical action with survival horror and thrusts gamers into a deep and harrowing story of humankind's epic battle for survival against the Locust Horde, a nightmarish race of creatures that surface from the bowels of the planet. Lead war hero Marcus Fenix and his fire team as they face the onslaught of merciless warrior fiends. A revolutionary tactical combat system and breathtaking, high-definition visuals from the Unreal Engine 3 immerse you in a horrifying story of war and survival. A.I. teammates are indiscernable from human players. Voice recognition and real-time lip synching heighten the experience. The battlefield is a lethal place. To survive, suppress your enemy with blindfire, take cover in interactive environments, or use weapons and teammates to outwit your foes.